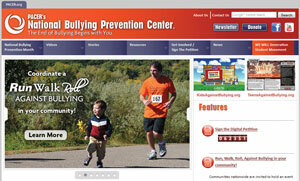 This is the portal for parents and educators to access bullying resources, including educational toolkits, awareness toolkits, contest ideas, promotional products, and more. Teens Against Bullying Web site is a relevant, edgy, and unique educational resource for bullying prevention designed to engage, empower and educate all teens. Information is presented in an innovative, engaging and interactive style. There are solutions—creative resources that all teens—can use to educate other teens and young people and to raise awareness in their community or to help other teens in bullying situations. "Kids Against Bullying" was created for elementary school children, with a unique emphasis on children with disabilities. This Web site is an informative and creative resource to educate students about bullying prevention and provide methods to respond to bullying situations. The site features an animated cast of characters, information, celebrity videos, Webisodes, interactive games, animation, contests, and other activities. Parents and professionals will find helpful tips, intervention strategies, and resources for use at home or school. The road to adulthood for youth with disabilities is filled with opportunity, and parents play a key role. PACER’s National Parent Center on Transition and Employment is ready with the information families want, presented in a way families can use. PACER’s National Parent Center on Transition and Employment builds on PACER’s decades of experience providing high quality assistance and support to parents, youth, and professionals on transition topics. This innovative new project will keep the needs of families at the forefront and help youth with disabilities find success in postsecondary education, employment, and life in the community.